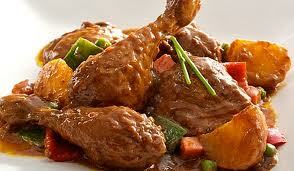 Chicken Kaldereta is another chicken dish which most of us Filipinos really love. The twist in this dish is that the chicken meat is used for the Kaldereta in place of the commonly used goat meat, beef and any other meats. This dish is also, somehow familiar to that of the afritada. Chicken Kaldereta is plainly just the chicken meat marinated and sautéed, then cooked with tomato sauce, bell pepper, potatoes and sweet pickle relish. To thicken the sauce you just have to use the liver spread or if you already have the prepared lechon sauce, that will do. Since we Filipinos have that high tolerance to eat chili food, or we love eating chili food, you can make this dish spicy if you want. Just make sure that you balanced well the siling labuyo and the powdered pepper with the other ingredients to avoid the unwanted taste. All the ingredients in this dish are very much available on our supermarkets. So, you don’t have to worry about that. And for the cooking itself, you don’t have to be anxious if you are just a beginner because this dish is totally easy to make! Just take note of the time period in cooking and on measuring all the ingredients. Get on for an easy but delicious cooking! Enjoy!